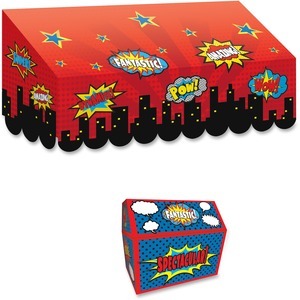 Give your classroom a glamorous makeover with these Superhero awnings. Mix and match your favorite patterns and colors to create the perfect themed classroom. Hang these sturdy awnings over your bulletin boards and entryways. Or use to organize work areas and make fun learning corners. Use the included Classroom Chest to hold rewards for achievements, readers, manipulatives for learning centers, special surprises, wristbands, stickers and more. Assembled chest measures 9-1/2" wide x 8" deep x 8-1/2" high. Directions for assembly are included.